Sometime after I installed Photoshop CS5, I notice that after I control-click on a file that Photoshop can open, its all messed up with super long names. 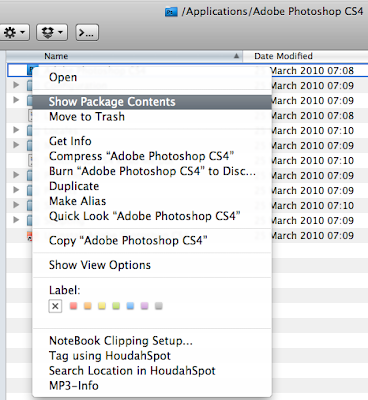 In the screenshot you see I get this for Photoshop CS4. You might ask well why don't I just uninstall PS 4? Well I would, but its part of Creative Studio 4, and I need that for Acrobat and Illustrator. (Oh dear Adobe integrated installer). 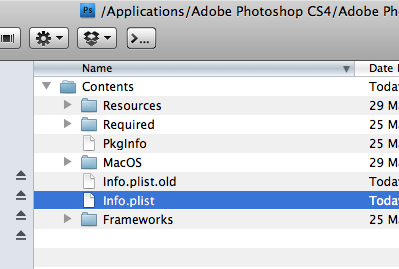 The answer is that the applications .plist has too much information. "/Applications/Adobe Photoshop CS4/Adobe Photoshop CS4.app/Contents"
Both of these methods open the correct folder. You need to open the info.plist, TextWrangler will do, and remove the extra text you see. You should backup the old file first because otherwise Adobe updater will break.